Crude Oil has many uses but not many people would think of it as a spa product. 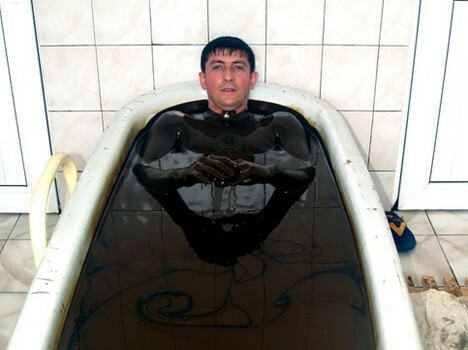 The Freaky visits Azerbaijan where people bathe in dark slimy crude oil for fun. Azerbaijan is country rich in oil, but the crude oil found around Naftalan is too heavy to be usable in industrial applications or to be exported, so it is designated for ‘medicinal’ use instead. At clinics in the town patients bathe in big baths of crude oil believing it will help cure illnesses, including arthritis, rheumatism and psoriasis. They soak themselves in 35 gallons of crude , at a temperature of 40 degrees for 10 minutes, before being wiped down by an attendant with paper towels, followed by a series of showers. The clinic’s patients swear by it, they say the warm oil relaxes their joints. And there have been studies done by Soviet scientists that have identified antibiotic and anti-inflammatory properties in the oil. But other scientists aren’t so sure – patients are only allowed to soak in the sticky substance for 10 minutes because the crude oil contains almost 50% napthalene a carcinogens, which can be dangerous to your health. Despite this, the city’s doctors claim millions of people have been treated at Naftalan over the years, and none of them have suffered any complications, as a result. This is the first time I am Hearing about this .It is some what amazing!!! !